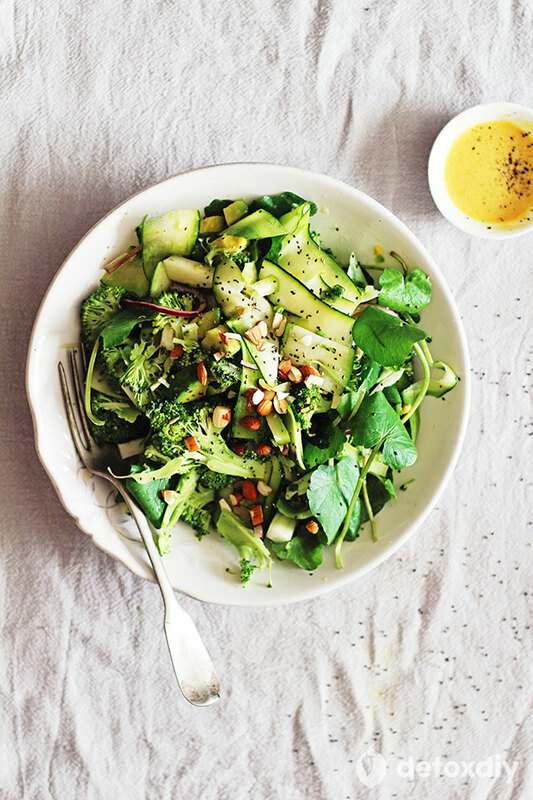 This salad is my favorite choice whenever I feel that my energy is low, that my system needs a detox or simply when I want to eat something fresh and nourishing. Fresh vegetables are a great for refreshing your system, because they’re loaded with potassium and antioxidants, helping your cells to oxygenate and easing the chemical exchanges in their membrane. I usually prefer green veggies because chlorophyll nourishes the cells, but your can include pretty much any vegetable you like. They’re all a blessing for your health and a great support for restoring your wellbeing. The vegetable that I always rely on when it comes to detox is the mighty broccoli. Loaded with vitamins, minerals, fiber and powerful antioxidants, broccoli is an ingredient we should eat at least twice a week. Even if we’re having a clean diet, we’re exposed daily to potentially toxic substances: pollution, chemicals in our non-organic food, chemicals in our cosmetics, so every now and then our bodies need an extra kick of fresh protection to restore its natural detox function. Broccoli gives a great support when it comes with fighting toxicity and chronic inflammation, the main causes of chronic diseases. The glucosinolates, found in big amounts in broccoli, activate the natural detoxification process and, along with the omega-3 fatty acids and vitamin C create an anti-inflammatory and antioxidant shield. The fiber in broccoli help maintaining a healthy digestive system, by reducing the intestinal transit time for the food we eat. Most vegetables contain, in small doses, essential fatty acids, which are the main compounds of the anti-inflammatory molecules in our body. We can’t only rely on these small doses. We should always give the body enough quantities of fatty acids from healthy fats like coconut oil, flaxseed oil, extra virgin olive oil or avocado. This is why my salads most often contains avocado and a dressing made with extra virgin olive oil. Avocado enriches any dish with minerals, antioxidants, vitamins and fiber. 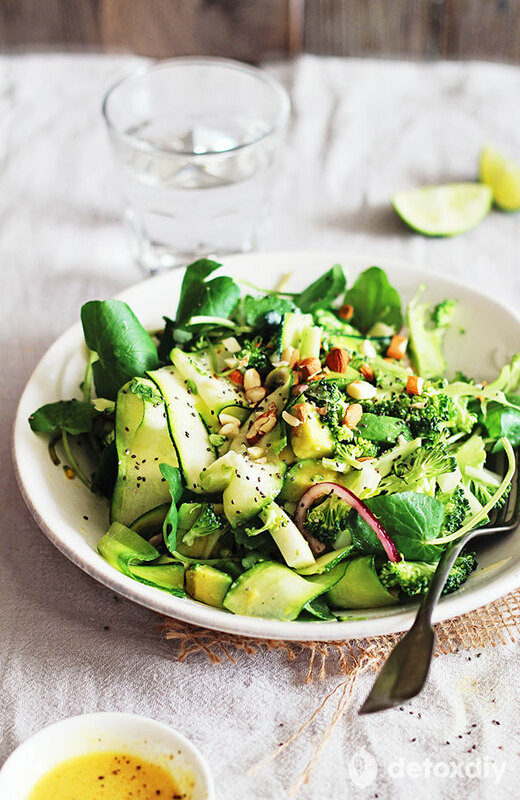 The combination between broccoli and avocado is especially good for diets low in vitamin D, essential for the body health, because they both contain high amounts of vitamin K, which is stabilizer of vitamin D.
Load your salad with fresh vegetables of season; I used fennel, zucchini and watercress, but you can also add carrots, beetroot, cucumber, spinach and any other fresh ingredient you find at the farmers’ market- your body will thank you! Add the vegetables in a large bowl and toss to combine. Add the olive oil, lemon juice, mustard and sea salt in a small bowl and whisk to obtain a creamy dressing. Pour the dressing over the salad, add chia seeds and almonds and mix to combine. Set aside for 5-10 minutes for the flavors to combine then serve. 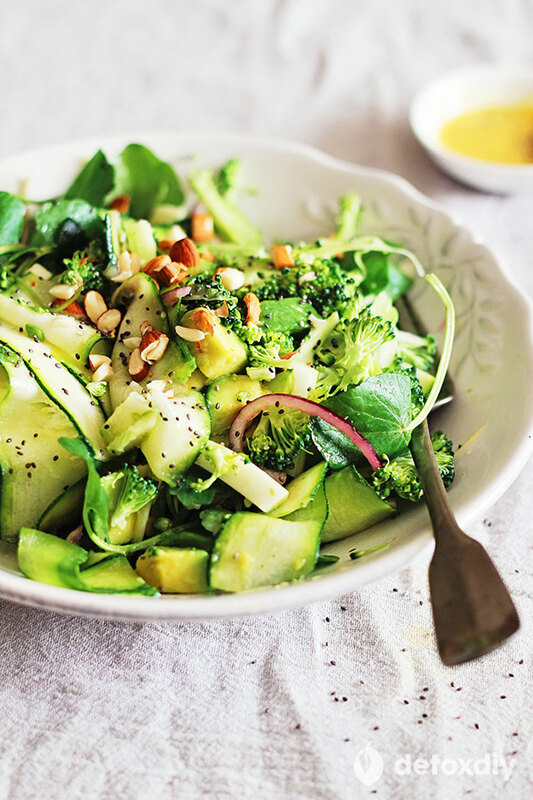 your salad looks fabulous – coukd you get the same results without the onion?